Mornings at Polly' at the Pier. Coffee or Tea? 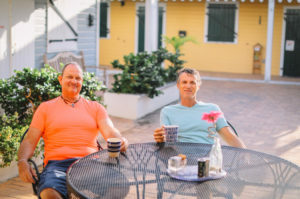 Mornings at Polly’s at the Pier where Chris enjoys our world class coffee from our boutique roaster and Chuck enjoys a cup of one of our large selection of Taco teas. Later in the day, Chris switches to our Iced Coffee served over Coffee Cubes (why dilute?!) and Chuck switches to one of our fresh brewed Iced Teas from our boutique Tea supplier. ← Menu change is in the air!